NWA 6704 is a special meteorite which has properties that make it difficult to place in any known category of classification. The story of its discovery by Gregory M. Hupé is a feature article at Meteorite Times and provides a nice look into the art of meteorite discovery. Slices showing the internal meteorite texture have an eerie green coloration… in fact, it makes me think of kryptonite! 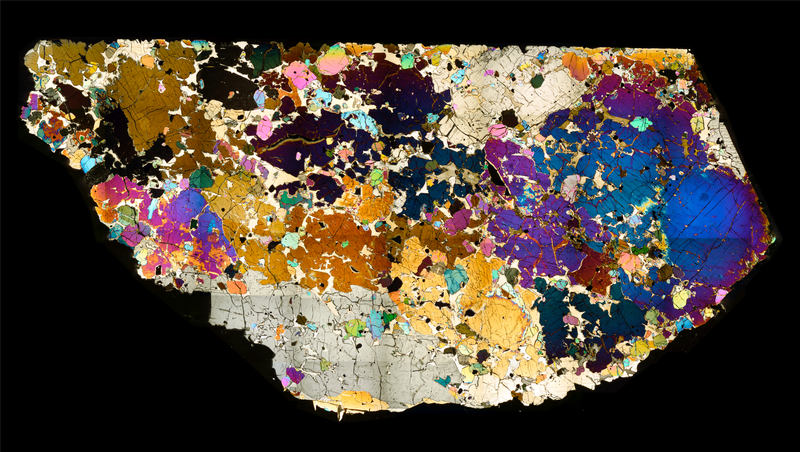 This thin section of NWA 6704 is composed of large orthopyroxene oikocrysts which, due to their intricate polarized color gradients, were difficult to seamlessly stitch together. The final result is rainbow of vivid colors, patterns etched almost 4.52 billion years ago. Be sure to view the links below for additional information and images.